May celebrates Older Americans Month, which this year focuses on promoting health and community engagement of seniors across the nation. Today, 14.1% of the U.S. population is aged 65 and older1 and by 2030, 20% of the population will be over 65.2 We are living longer, healthier, and more productive lives than ever before. Over the years there has been investigation into aging and the life course, reflecting beliefs informed by the average lifespans of the time. 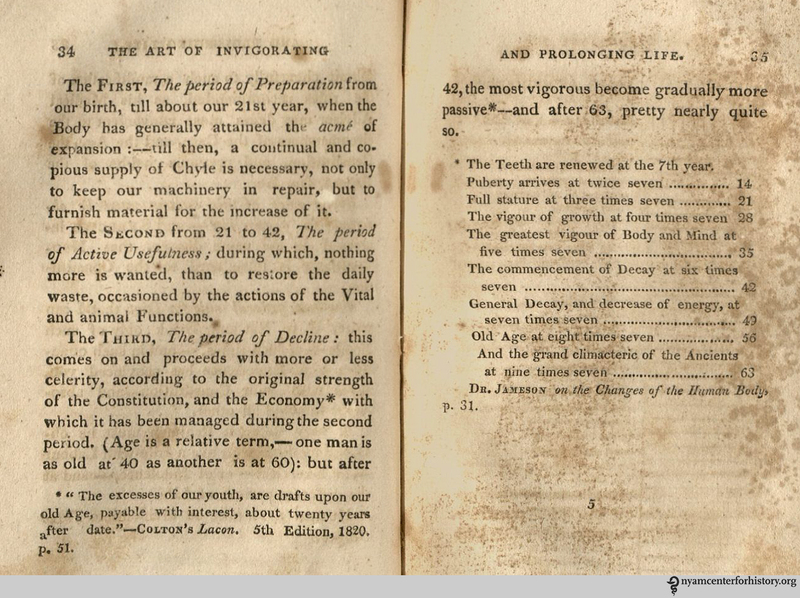 The Art of Invigorating and Prolonging Life by William Kitchiner, published in 1821 in the U.K. and two years later in the U.S., suggested that life is divided into three stages, each stage requiring a different regimen of “food – clothes – fire – air – exercise – sleep – wine – &c.”3 Kitchiner cautions that people only realize the importance of these elements after they become enslaved to other, detrimental, habits. They may need to proceed gradually with his recommendations in order to correct the bad habits and form new ones. Pages 34-35 of Kitchiner, The Art of Invigorating and Prolonging Life, 1823 edition. Click to enlarge. According to Kitchiner, by 42 years of age humans are on the decline; they are ancient by 63. Put in context, life expectancy in the 1900s for men was 46.3 in the U.S.and 44 in the UK.5,6 But still, Kitchiner believed it was never too late to make up for lost time. William Jones’ Andrometer, on pages 36-37 of Kitchiner, The Art of Invigorating and Prolonging Life, 1823 edition. Click to enlarge. Unfortunately, Jones passed away in his late 40s and Kitchiner in his 50s. Sadly, neither got to experience “a glorious retirement” or the “universal respect” due after the age of 60. 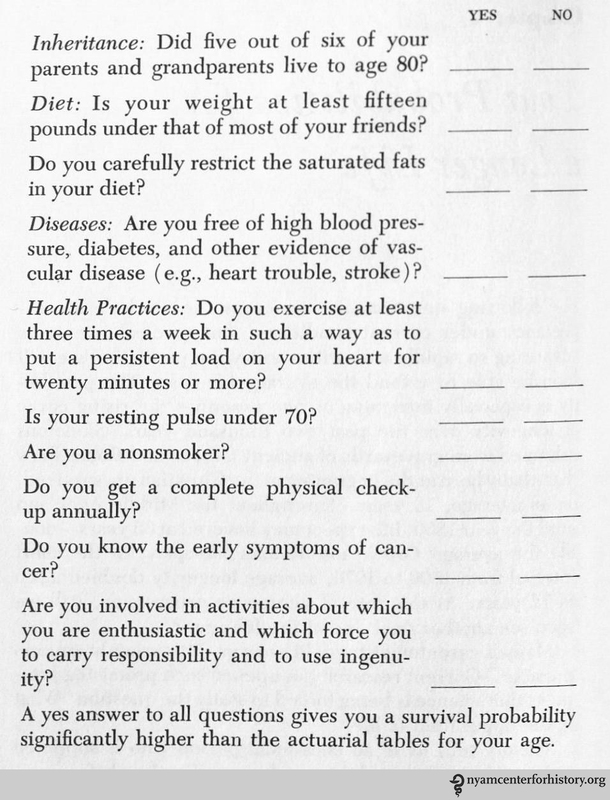 Stonecypher offered the following questionnaire as a way for readers to assess the probability of living a long life, but goes on to explain that medical science was advancing so rapidly it could be possible to double the life span to over 100 years. Citing that in classical Greece and Rome average life expectancy was 18 years, he writes that by the 1800s it had doubled to 35 years and between 1800 and 1970 it doubled again to 72 years. In Stonecypher, Getting Older and Staying Young, 1974. This year, the Medicare, Medicaid and the Older American Act celebrates its 50th anniversary.12 The Act led to programs that have ensured access to health care, community services, and protections of the rights of elders. We have come a long way, but have even more work to do to support health and productivity of seniors as the population ages. 1. U.S. Census Bureau. State and County QuickFacts. http://quickfacts.census.gov/qfd/states/00000.html. Accessed May 21, 2015. 2. U.S. Census Bureau. An Aging Nation: the Older Population in the United States. Washington, D.C.: U.S. Census Bureau; 2014. http://www.cdc.gov/nchs/data/nvsr/nvsr62/nvsr62_07.pdf. Accessed May 21, 2015. 3. Kitchiner William. The Art of Invigorating and Prolonging Life. Philadelphia : H. C. Carey & I. Lea; 1823. 5. U.S. Census Bureau. United States Life Tables, 2009.. Washington, D.C.: U.S. Census Bureau; 2014. http://www.cdc.gov/nchs/data/nvsr/nvsr62/nvsr62_07.pdf. Accessed May 21, 2015. 6. England. Office for National Statistics. Mortality in England and Wales: Average Life Span, 2010. England: Office for National Statsitcs; 2012. http://www.ons.gov.uk/ons/dcp171776_292196.pdf. Accessed May 22, 2015. 7. Mental Floss. 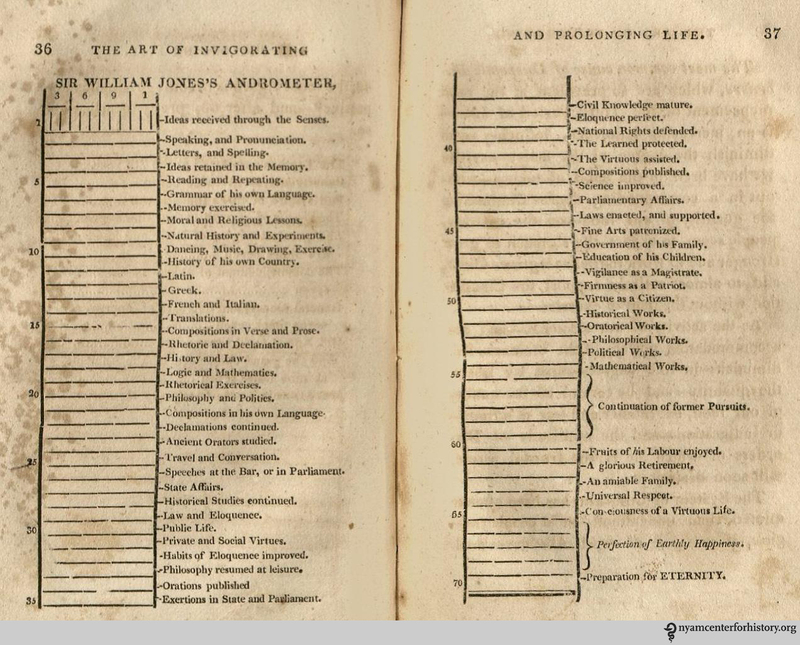 The Andrometer: an 18th-Century Measuring Stick for Success in Life. http://mentalfloss.com/article/58057/andrometer-18th-century-measuring-stick-success-life. Accessed May 21, 2015. 8. Jones, William. The works of Sir William Jones, Volumes 1-2, 1807. http://books.google.com/books?id=PW5KAAAAYAAJ&printsec=frontcover&source=gbs_ge_summary_r&cad=0#v=onepage&q&f=false. Accessed May 21, 2015. 9. Stonecypher D. D. Getting Older and Staying Young. [1st ed.]. New York : Norton; 1973. 10. U.S. Census Bureau. United States Life Tables, 2009.. Washington, D.C.: U.S. Census Bureau; 2014. http://www.cdc.gov/nchs/data/nvsr/nvsr62/nvsr62_07.pdf. Accessed May 21, 2015. 11. U.S. Census Bureau. Health, United States, 2014. Washington, D.C.: U.S. Census Bureau; 2014. http://www.cdc.gov/nchs/data/hus/hus14.pdf. Accessed May 21, 2015. 12. 2015 White House Conference on Aging. http://www.whitehouseconferenceonaging.gov/about/index.html. Accessed May 21, 2015. This entry was posted in Collections, History of medicine and tagged aging, D. D. Stonecypher, healthy aging, William Kitchiner by nyamhistorymed. Bookmark the permalink.